If I were asked, "What is the most important reason for celebrating the birthdays of children's authors with your family?" my answer would be quick and easy. "It exposes my children to a variety of books, topics, and writing styles." Each birthday celebration is about trying something new. It is important for me as a parent to expose my children to as much as possible and allow them to develop their own interests. 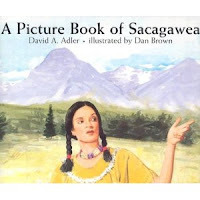 Last year, when we celebrated David A. Adler's birthday, I brought home many of the Adler's Picture Book Biographies from the library to read with my daughter. It was through these books that she discovered an interest in biographies and history. When we returned to the library the next week, I still remember the stunned look on the face of the librarian when my then 4-year old daughter asked, "Where is the biography section?" Now, she still is frequent visitor to this section of the library. I am quite positive that she wouldn't have discovered these books without celebrating his birthday last year. David A. Adler had a variety of experiences before becoming a full-time writer. He loved drawing as a child and followed that interest to have "more than 200 of his drawings and cartoons published in magazines and newspapers" (Houghton Mifflin). He spent nine years as a math teacher after attending college to study economics (David A. Adler's website). It wasn't until he became a stay at home dad while on child care leave with his first son that he got really serious about writing. He took advantage of nap times to write Cam Jansen and the Mystery of the Stolen Diamonds during his first year of leave. (Gotta love nap times - I am writing this post while my youngest is upstairs napping and the other two are at an Easter Egg Hunt). The variety in Adler's life continued during his writing career. He is probably most recognized for his Cam Jansen Series. However, he has written over 200 books including many non-fiction books. I have mentioned the Picture Book Biographies but he has also written many about the Holocaust, math concepts and baseball. (For last year's birthday celebration I tried to group many of his books into categories.) David A. Adler talked about the variety of his work in a "Meet the Author" interview with Houghton Mifflin when he said, "Because of the diversity of the books I write, I am able to vary my work even in a single day from research on a nonfiction book to fiction writing to riddle writing." In reading the Picture Book Biographies this week, I decided to make an activity sheet that I hope can help more children discover the love of biographies through David A. Adler's work. 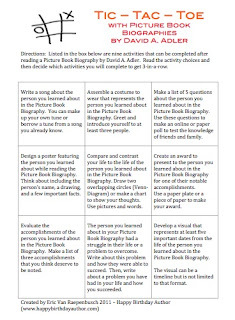 The activity sheet that I developed is called "Tic-Tac-Toe with Picture Book Biographies by David A. Adler". On the activity sheet there are nine activities that could be used with one or many of the Picture Book Biographies. The idea is to have the child choose the activities they want to complete while trying to get three-in-a-row. I used this activity technique many times during a two-year assignment teaching gifted students. I tried to include many higher level thinking activities based upon Bloom's Taxonomy. I hope parents, teachers, and homeschooling families can use this sheet along with many of the resources below in the "Links" section to further explore Alder's biography books. I loved his George Washington drawing, especially the buttons on the jacket. We also completed a George Washington Foam craft which is in the upper right hand corner. As a child and in my household we have always had birthday cake for breakfast. We want the celebration to begin as early as possible. There's also a gift table so whenever the birthday person wakes up the gifts are there waiting. Of course, this means we must get to bed early the night before our birthdays so the table can be set up -- and no peaking. David, thank you so much for responding with your birthday thoughts. My daughter loves your books, and also loved your birthday tradition. I think we will be having birthday cake for breakfast on her birthday that is quickly approaching.